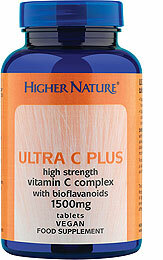 Higher Nature Ultra C Plus (Size 90) provides 1000mg of Vitamin C plus 500mg Citrus Bioflavonoids, known to work in synergy with Vitamin C in the body, as well as supporting healthy veins. Ultra C Plus provides 1000mg of Vitamin C plus 500mg Citrus Bioflavonoids, known to work in synergy with Vitamin C in the body, as well as supporting healthy veins. A daily multivitamin is also recommended.